We would be remiss to not recommend our own software! QuickPhase Pro is the easy and quick way to view the moon phases, as well as other moon details like moonrise, moonset and where the moon is in the sky, full moons, new moons, and more ... for any date and time you enter ... for anywhere in the world! Included are monthly calendars, including printable versions. For moon data, it's quicker and more versatile than big astronomy programs. 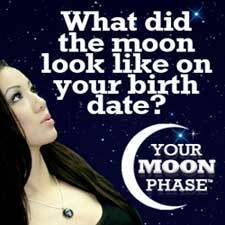 The website YourMoonPhase.com offers beautiful necklaces, keychains and personalized matted photos that depict YOUR moon phase  what the moon looked like when you were born, or any other special event in your life, like an anniversary. You may also want to look at the MoonConnection "Moon Shop" with selected Amazon moon products  and our "Moon Posters" Store for beautiful moon images for your wall.